As Prospero prepares to set sail for Naples in the closing pages of The Tempest, we as an audience are possibly given to wonder what a sequel might be like, following their fortunes as they rebuild their lives. 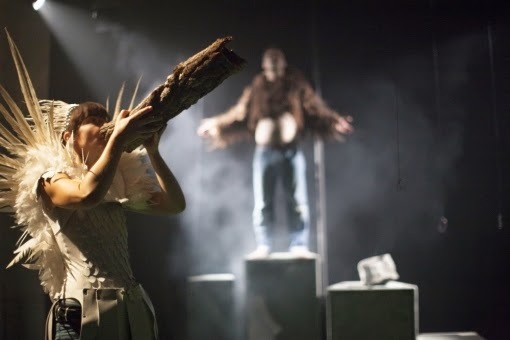 Theatre makers Uninvited Guests and producer Fuel have concerned themselves in This Last Tempest with what may become of Ariel and Caliban if they remain behind on the island, now free of the spells that bound them. They may well be the stuff that dreams are made on, but their little lives aren’t ready to be rounded off with a sleep just yet. Caliban rejoices long and loud at first, while Ariel maintains a more cautious stance, aware of the pitfalls of getting what you wish for. Jessica Hoffmann and Richard Dufty are Ariel and Caliban, and they’re aided and abetted in their storytelling by musician Neil Johnson, who also opens the play in the manner of a chorus. To describe the narrative would be to spoil the show, but suffice to say that the characters explore ideas of freedom, whilst reflecting on the events that brought them to this point and the possibilities for their future. A three dimensional soundscape reaches beyond the simple set into every recess of the room, and the audience get to touch the sounds of the island too. This, together with hypnotic performances and writing that has a rhythm of Shakespeare but an air of modernity, create an atmospheric and magical evening. This Last Tempest continues touring 17 Feb at Aberystwyth Arts Centre, 19th Feb at Axis Arts Centre Crewe and 20/21 Feb at Brighton Dome.